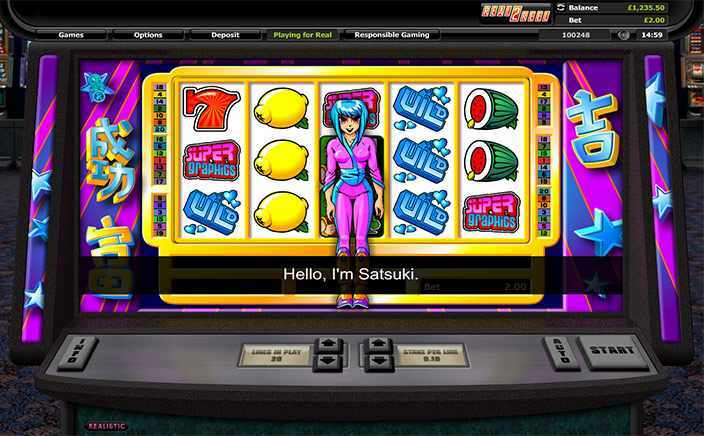 Super Graphics Upside Down is a game that will remind you of every Japanese adventure TV show that you have watched, except that you get to play this slot game with anime characters instead of real people. That shouldn’t matter especially when you see just how much you have the potential to win with this game if you are lucky and patient enough with it! 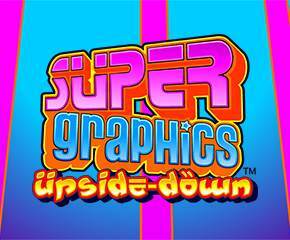 Super Graphics Upside Down is a game from Realistic, a gaming company that is definitely trying to keep it real in the online slot world. The game is colourful, to say the least, and is packed with features that will keep you hooked on to your mobile device as you make spin after spin. Super Graphics Upside Down has 5 reels and 20 paylines, and has a Japanese theme to it. You can tell, especially from the anime characters adorning the reels, the extremely generous use of colour on every one of the game’s symbols as well as reels and also the use of questionable grammar in the game. The symbols themselves will put you in mind of a Vegas style slot game since there are your standard fruit symbols among others. The fruit symbols can get you a 20x stake multiplier if you get a complete matching payline of them with all five of them. If you get only four of these symbols you can expect a 10x stake multiplier, while three of the symbols give you a 5x stake multiplier. The anime characters give you payouts starting from 10x through to 80x on your wager, while the red 7s can win you 250x your wager if you get all five of them, 100x if you get just four of them and 50x if you get just three of them. · Wild substitutions: The wild symbol in Super Graphics Upside Down is the blue symbol that says Wild. You can use this symbol to stand in for other symbols so that you can get a winning payline. Any payline that uses the wild symbol attracts a 5000x bet multiplier. · Free spins: The scatter symbol is the game logo and if you get three or more of them you can enter the game’s special free spins mode in which the 15 free spins are played upside down (hence the game’s title) so that you can read them in the opposite way than you normally would. This makes for some easy wins especially if you are lucky enough to get yourself the free spins that reads the winning paylines for you to your favour.